Taking a step away from the hectic world of coffee and energy drinks for a day, I decided to check in on the caffeinated candy industry. What I stumbled upon this time was an energy gum that’s marketed as helping boost thinking, memory, and concentration. Before we get to the name lets recall last time I reviewed a product how I mentioned that a name like “Wild N’ Out” can quickly destroy a good first impression. Now I discover that the exact same thing can occur with a no-frills name like the product ThinkGum has. ThinkGum might want to Think Different in the future. We already know the product supposedly boosts brain power why make us feel like we need to be reminded? Disappointment of the product name aside, I tested the product to see if any of the claims were truthful. ThinkGum includes a wide range of ingredients that have long been thought to help enhance cognitive abilities, some of which are Ginkgo Biloba, Guarana, Vinpocetine (cognitive enhancer), Bacopa (speeds information processing), and Natural Caffeine. Along with the “brain-boosters” the gum also contains peppermint (for flavoring and relaxation) and rosemary (for energy and stress relief). If you haven’t figured it out by now, the caffeine product world is all a numbers game. One of the first things people will check for is total caffeine, then flavor, design, etc. ThinkGum tries to dispel this myth, adding only 10mg of caffeine per piece (20mg per package) and for this type of product they could be onto something. Anyone who has tried to take a test strung out on Spike or Redline knows that too much can sometimes be a bad thing. A product targeted towards college level studying is smart to avoid the peak and subsequent crash of most caffeinated products. Trying the product for myself left me with mixed impressions. The first five seconds start with a pleasant peppermint flavor but is quickly shown to only be a cover for the strong herbal taste inside. The outer white coating is actually nothing like the inner brownish gum which disturbingly has small gritty specks mixed in. Some things you just don’t want to have to see in gum. Having been used to such high amounts of caffeine in the past I struggled to notice any sort of caffeine related effects but I’m sure it was there, on an upper note my concentration did noticeably improve after chewing for the instructed fifteen minutes, but could have been due to any of the ingredients. 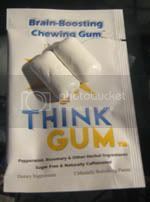 A product like ThinkGum tends to be mild mannered for what most people would be looking for when browsing this site and seeing as the only purchasing option is for $32 worth of two piece packages from their buy page it’s hard to justify the trial. If you do happen to see the gum in stores, you might look into trying it, apparently this gum is very popular at UCLA and might be more helpful to you than it was for me. Guide to Caffeinated Gum: Varieties, Price, and Caffeine Levels Energy gum caffeine content, flavor, and the price of popular caffeine chewing gums available as well as their limitations and dangers. Stay Alert: Caffeinated Military Gum for the Masses Military Energy Gum (previously Stay Alert Gum) review. How the caffeinated gum works, tastes, and what others think of it.